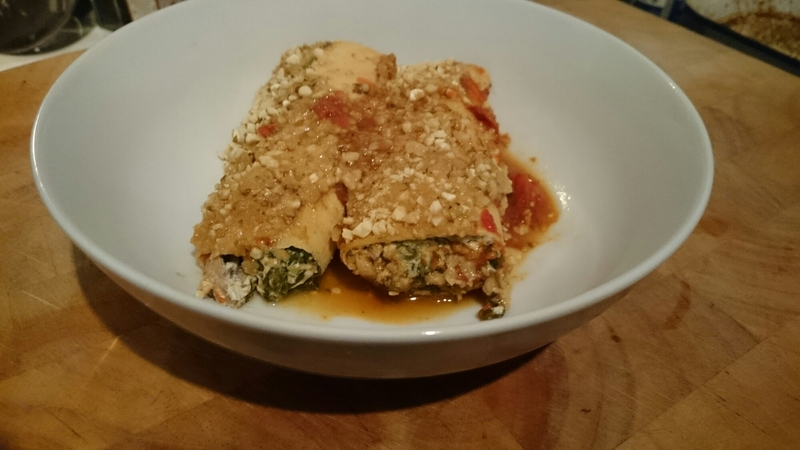 This dish made a fun and tasty supper, the paper tofu was rolled around a mix of strained soy yoghurt, spinach and mushrooms, cooked in a tomato sauce and topped with a mix of cashew nuts and nutritional yeast. Paper tofu, if you haven’t encountered it before, is very reminiscent of fresh lasagne sheets in both appearance and texture. It takes very little cooking and is a lot of fun to play with! I’ve microwaved my veg which allowed me to collect all the liquid from them to use as the basis of the sauce. Microwave the frozen spinach and sliced mushrooms together until defrosted and the mushrooms are cooked. Squeeze the liquid out of the spinach and mushrooms into an oven proof dish, add the tomatoes, oregano, cider vinegar and tamari to the dish and place in the oven. We want the sauce to reduce, the tomatoes will help thicken it slightly. After 20 minutes smush the tomatoes into the sauce and return to the oven for a further 15 minutes. Combine the squeezed spinach and mushrooms with the strained yoghurt, lemon juice and nutmeg, salt to taste. Blitz together the cashews and nutritional yeast adding salt to taste. Roll the spinach and yoghurt mixture up in the paper tofu. Remove the sauce from the oven and, carefully, add the cannelloni, spoon over the sauce and top with cashew mix. Return to the oven for 15 minutes until the topping is golden.